It was a damp and dreary Sunday afternoon after an endlessly wet week, and yet scores of wonderful wild swimmers turned out to hear our talk about the swims of Torbay (see below). THANK YOU to all who came, and who then, in true Dunkirk spirit, braved the foul weather to walk to the cliff railway and head down to Oddicombe Beach for a dip. Not for us a balmy swim in flat blue seas on a sunny summer's afternoon. No siree! 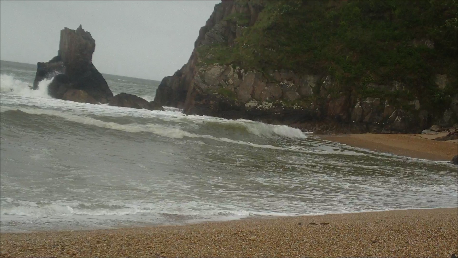 Instead we had pounding surf, swirling sands and JELLYFISH! Several people were stung, fortunately not badly. Don't you just love the English summer? Thanks to Sally Morgan for the picture. This weekend, if you're in Devon, do please come to a talk I'm giving with my friend and swimming buddy Matt Newbury. It's called Coastal Capers and Aquatic Adventures (yes! ), and is revealing some of the swimming secrets of Torbay, a part of Devon that - till now - has been frequently overlooked by wild swimmers. The Bay has the most amazing social and cultural history of swimming, as well as a stunning coastline with caves, coves, cliffs and corals. Come and join us at St Anne's Hall in Babbacombe, Torquay, on Sunday 10th June. 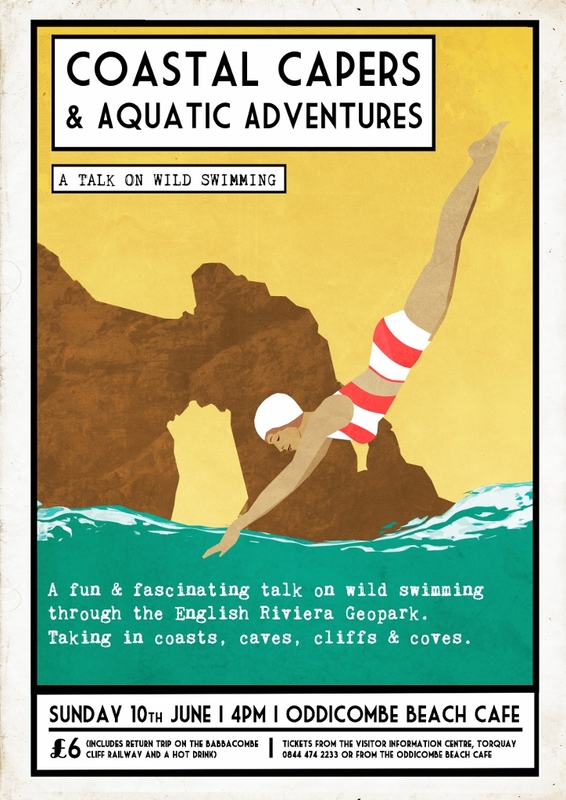 Tickets are £6 and include a trip afterwards on the quirky Cliff Railway to Oddicombe Beach where you can have a dip and a free coffee at the cafe, and share swimming stories with fellow enthusiasts! Map showing the venues here. Gales have been pounding the south west, with news reports excitedly talking about 'mountainous' seas. Today I reckoned that Blackpool Sands might be a good bet - the webcam there (thanks Venus cafe) showed what appeared to be calm seas. But on arrival this was not the case; there were high rise rollers and colossal undertow which was sucking back the shingle. I had to admit defeat and instead went to Wa rfleet Creek at nearby Dartmouth where I swam in the estuary with the ducks. 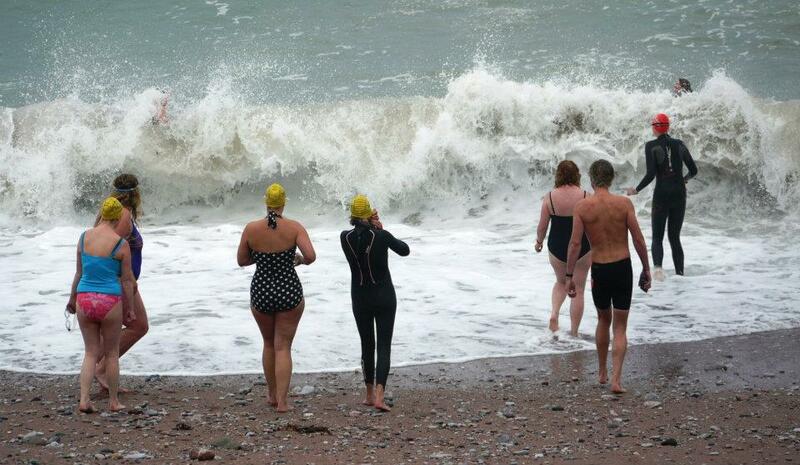 Watcombe is a tucked-away beach in Torquay, where Channel swimmers regularly train. Many people are put off by the walk down, and even more by the steep walk back up. It is a perfect little cove, with many devotees, including Paul, a diver who runs the cafe purely as a hobby and a way of spending time there; he swears his coffees and teas, at just 70p, are the cheapest in the Bay. We nattered for ages, with Paul telling amazing stories about the phosphorescence you can see here at night on warm days in September. Today the sea was finally flat after days of surf and mess from the Easterly winds. Matt and I swam north out of the cove and found a really exciting swim-through channel, suffused with light underwater. Glorious. I'll definitely be back in September for a night swim.